The Changed Utterly blog project ran for a year from April 2015 and was accompanied by the twitter account @TCDLib1916. 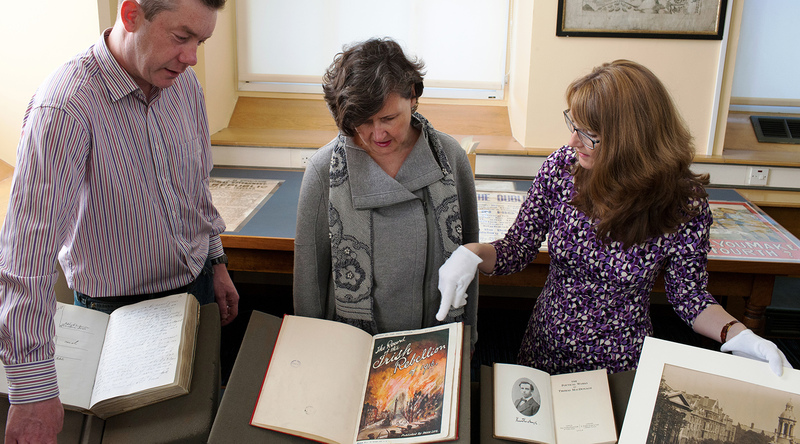 The aim was to showcase the surprising breadth of the 1916 collections held by the Library and to act as a catalyst for research ahead of the anniversary commemorations of the Easter Rising in April 2016. The blog was redeveloped into this website in 2017. The project drew on the rich and diverse collections of 1916 material held in the Research Collections departments of The Library of Trinity College Dublin – The Manuscripts & Archives Research Library (M&ARL), The Department of Early Printed Books and Special Collections, The Glucksman Map Library and the Music Library. Lead by Estelle Gittins (M&ARL) and Shane Mawe (EPB), with technical support provided by Greg Sheaf (Web Services Librarian), and photography by Gillian Whelan (Digital Collections), it also involved collaboration across all Library departments. Blog posts have been written by Library staff, and occasionally by Trinity College academics and other experts in the period. The posts explore the Library’s collections of 1916-related material originating from before, during and after the Rising, from all sides of the political spectrum. Watch project lead Estelle Gittins talk about the evolution of the project and collections covered at the March 2016 RLUK conference. The project became the flagship offering from Trinity College Dublin for the centenary commemoration of the Rising, and garnered much press attention, especially for the piece on the Library’s copy of the Proclamation. A physical exhibition featuring the subjects of the most popular blog posts was held in the Long Room of the Old Library of Trinity College Dublin for the centenary commemorations March 2016- 27 April 2016. This site does not provide an exhaustive list of all 1916-related items within the Research Collections departments. To access further information on the holdings contact the relevant departments concerned. The Library of Trinity College also actively collects 1916 material, please also contact us if you would like to donate either archival or printed material. All content and images on this site, unless otherwise stated, are the copyright of Trinity College Library. The Banner image is reproduced with the kind permission of the estate of T W Murphy. The site is hosted by Research IT at Trinity College Dublin.